Why is the Space Jam soundtrack so good? 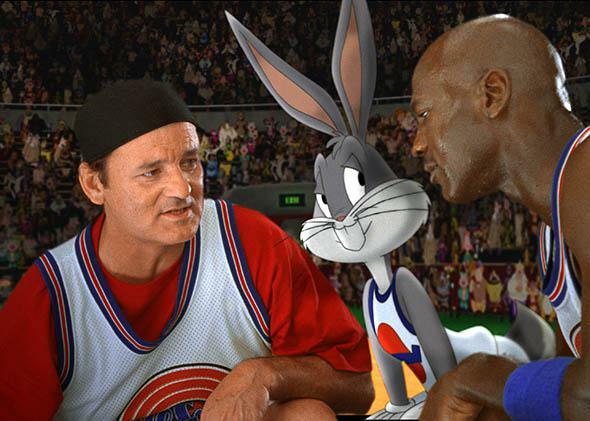 Bill Murray huddled with Bugs Bunny and Michael Jordan in Space Jam. This post originally appeared on Quora, the best answer to any question. Ask a question, get a great answer. Learn from experts and access insider knowledge. You can follow Quora on Twitter, Facebook, and Google Plus. I figured that this would be a good time to look at a basketball movie with an epic soundtrack, arguably one of the best ever among sports films and kids movies: Space Jam. If the name didn’t make it obvious enough, Looney Tunes and Merrie Melodies cartoons are musical in nature. The cartoons were originally developed by Warner Bros. as a platform to showcase their music. Music has always been an important part of the history of the franchise, mostly in the form of show tunes, big band, and other classic sounds of decades past. What made Space Jam so unusual in the history of the franchise was that this film went the modern music route rather than traditional. The Space Jam soundtrack was a collection of pop, hip-hop, and R&B. And to the surprise of most, it was all really, really good. The basic plot of the movie involves a high-stakes basketball game between the Monstars, a group of aliens who become 100-times basketball stars after stealing the talents of NBA basketball stars, and the Looney Tunes, who recruit NBA legend Michael Jordan to help them. With modern players in a modern game, it made sense to have contemporary music. All sports movies need inspirational songs, and this movie delivered two of the biggest inspirational hits of the ’90s. Monica’s “For You I Will” reached the top five of the Billboard chart and is one of her best vocal performances. Then there’s R. Kelly’s “I Believe I Can Fly,” the biggest hit of his career. The triple Grammy Award–winning song is about personal achievement, but it could be interpreted as flying/jumping high on a basketball court. Another “fly” song that has a dual meaning in the context of the movie is Seal’s “Fly Like an Eagle.” A cover of Steve Miller’s classic, this song is set to montages of Michael Jordan training and showing off his signature dunks, fitting for the theme of flying. Consistent with actual basketball games of the time, the movie features several “jock jams,” or dance/techno songs that were popular at sports venues in the ’90s. Technotronic’s “Pump Up the Jam,” C+C Music Factory’s “Gonna Make You Sweat,” and II Unlimited’s “Get Ready for This” were good choices for the movie, as they are accurate representations of the jock jams of the time. “Get Ready for This” played when the Tune Team was introduced during the pregame, similar to how the song was (and still is) used at sports venues. One of the surprising songs on the soundtrack was “Hit ’Em High.” Since the Monstars were a quintet of basketball all-stars, their theme song was by a quintet of hip hop all-stars. Busta Rhymes, LL Cool J, Method Man, Coolio, and B-Real from Cypress Hill teamed up on this song, and results are solid. There have been rumors of a Space Jam sequel floating around for years, most likely starring LeBron James. I think this has some serious potential since LeBron is a charismatic athlete who could probably carry a movie as the lead actor (after all, he carried the Cleveland Cavs for years). All I know is, if Space Jam 2 has a soundtrack even half as good as the original, I’m on board. Space Jam: Which basketball players had their talent stolen by the Nerdlucks in Space Jam? Soundtracks: What are the best movie soundtracks? Music: What are the worst cases of plagiarism in music?